Question 1 Define the term fibre? Question 2 What is meant by term fabric? Question 3 Describe the process of making fabrics from fibre? Question 4 Give few examples of fibres? Question 5 Name 4 types of fabrics used by us? Question 6 What is yarn? Question 7 State the various uses of cotton fibres? Question 8 What are cotton fibres? A very thin thread-like strand from which cloth is made is called fibre. Fabric is produced by weaving or knitting long ,twisted threads called yarn made from fibres. Our school uniform, shirts ,trouser ,blouses ,skirts, shorts ,saree, shawl, blanket, bed sheets, towel, table cloth, curtains, duster are all made from different kinds of fabrics. We can see a large variety of fabrics. Some fabrics are made of cotton, others are made of wool or silk whereas other are made of synthetic material. We wear clothes made of cotton fabrics during the hot days of summer season and woollen clothes are worn in cold days of winter. The clothes made of silk fabrics and synthetic fabrics are the most comfortable when the weather is neither very hot nor very cold. yarn is a spun thread which is used for weaving or knitting fabrics. yarn is a long thread which is used for making fabrics. Fabrics are made of yarns, which are, in turn are made from fibres. A fabric is made of a network of threads or yarns going along the length and breadth of the fabric , at right angle to one another. Find a loose yarn at one of the edges of the piece of cotton fabric and pull it out with our hand.If no loose yarns are visible ,we can pull out the yarn from the fabric with the help of a pin or needle. We can go on pulling more and more yarns or threads from the piece of cotton fabric. In fact, the whole piece of cotton fabric can be pulled into a large number of pieces of yarn.A piece of cotton fabric is made up of cotton yarn or cotton threads woven together. A fabric is made up of yarns or threads woven together. Take out a yarn from a piece of cotton fabric. Place this piece of yarn on the table. Now, press one end of the yarn with the thumb of left hand and scratch the other end of yarn along its length with the nail of right hand thumb. We will find that the piece of cotton yarn splits into thin thread strands of cotton. This shows that the cotton yarn of the fabric is made up of still thinner strands of cotton. These thin strands of cotton which make up the yarn are called cotton fibres. Cotton fabric is made of cotton yarn which is made from cotton fibres. Fabrics are made up of yarn ,and yarn is made from fibres. 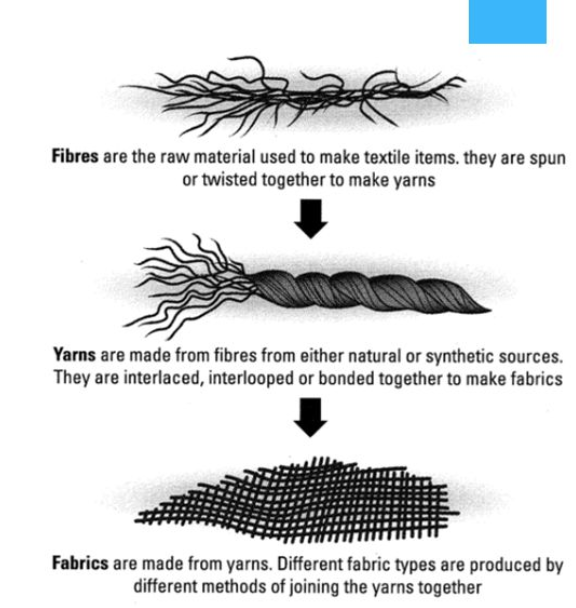 Fibres make yarn, and then yarn makes fabrics or cloth. Cotton is a white soft and fluffy material. If we hold a piece of cotton between our hands and pull it apart we will see a large number of very thin and tiny thread likes strands in it. These small and thin strands are called cotton fibres. A lump of cotton is a collection of a large number of fibres. Fibres are very thin, thread-like strands from which fabrics or cloth is made. Examples of fibres are cotton ,wool ,Silk ,flax ,Jute, nylon, polyester, polyacrylic. The fibres are spun into yarn which can then be woven on a Loom to make a fabric or cloth.